If you want to make your Brussels sprouts super tasty, this teriyaki rice bowl recipe is the way to do it. In fact, it’s a sure fire winner. 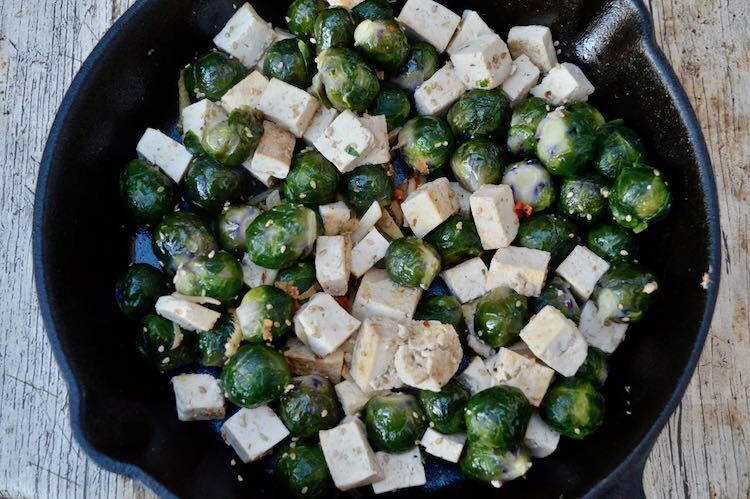 It’s quick and easy to make, is packed with protein rich tofu and nutritious Brussels sprouts and made extra delicious with my very own homemade teriyaki sauce. It’s completely dairy-free and a meal I was so impressed with that I made it twice during Veganuary this year. Before I started eating only plant based food this month, I really wasn’t sure if I’d manage to successfully complete Veganuary. I’m really pleased to report that I did. Not only did I stick to a vegan diet, but I found it so much easier than I’d imagined. There were a couple of hurdles at the beginning and then it was plain sailing all the way. I’ve eaten a wider variety of foods than I normally would and they were all delicious. Plus, I’ve lost half a stone. To be fair, this is more to do with my new year’s resolution to eat more sensibly, limit my sugar intake and cut out junk food. But I might not have managed it if it hadn’t been for Veganuary. I haven’t missed cheese. I haven’t missed milk chocolate and I haven’t missed eggs. Who’d have thought it? I have missed butter though. There’s absolutely no substitute for it. Before I started Veganuary, I had a look at some of the replacement plant spreads, but as I suspected, they all have too many additives in for my liking. I found nut butters worked brilliantly with marmite on toast, especially almond butter. But for everything else I’d normally have on toast, such as marmalade, I just abstained. I learnt that these vegan peanut butter banana muffins are some of the yummiest muffins I’ve ever eaten. I’ve learnt vegan breakfasts and lunches are to be enjoyed not feared. 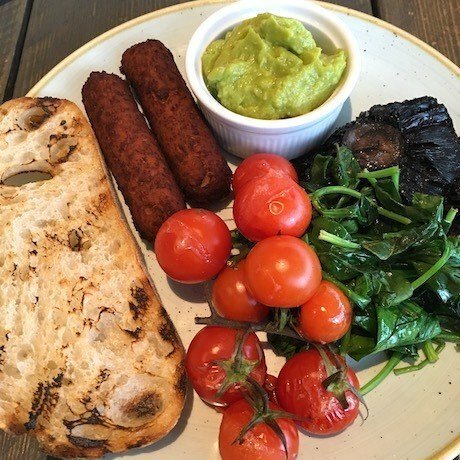 This post for 31 healthy vegan breakfasts helped. As for lunch, I could eat this mushroom pâté with walnuts and butter beans pretty much every day, but I’ve managed to constrain myself to only making two batches. I’ve also remembered just how good miso soup is. And I’ve learnt that despite my best efforts, I’m unable to make acquafaba meringues. Milk was one of the hurdles it took me a little while to overcome. Initially, I couldn’t find a non-dairy milk that I was happy with. Luckily, it didn’t take too long before I found some fantastic plant milks that I will continue to use. They’re organic, only have water and salt as additions and have a much higher percentage of nuts or oats than most of the others. Cashew milk is the most neutral. It’s great for cups of tea or cereal. Oat milk is the creamiest and this was the one I favoured most for porridge making. Almond is probably the most nutritious and I used that for my morning smoothies. We haven’t been out and about much this month, so it’s hard to know how easy it would be to find good food. We went out for a glorious vegan breakfast one Sunday morning. Or at least I did. CT had his usual full on cooked breakfast. But this was a planned trip because we knew the cafe in question laid on vegan breakfasts. I wasn’t so lucky when we were out with a friend and called into the local garden centre for a bite to eat. A cup of tea with soy milk was all that was on offer for me. I don’t think I’ll be going there again. Luckily cafes seem to have cottoned on to plant milks now. The only other time I went out was to meet a friend in town at one of our local cafes. I only wanted a drink and this wasn’t a problem as they had oat milk available. But I noted they had one vegan option on the lunchtime menu too. Will I Continue with a Vegan Diet? The short answer is no. I took part in Veganuary because I thought it would be good for me to have a solely plant based diet for a month. It has been. I feel healthier, I’ve learnt a few things and I’ve widened my repertoire. From now on I plan to eat less dairy and eggs than I used to and I’d like to have at least one day a week where I eat only plant-based foods. When next year comes around I’d really like to take the Veganuary challenge once again. Only this time, I’ll know it’s not really much of a challenge for a long-term vegetarian who already eats a lot of vegan meals. Even if you make your own teriyaki sauce like I did, this teriyaki rice bowl is still a super fast meal to put together. If you manage to soak the rice for a good eight hours or so before cooking, the whole thing can be done from start to finish in about 20 minutes. It’s a particularly good meal for a vegan midweek supper. Just get the rice soaking before you leave for work in the morning and it will be ready to cook when you get home. You’ll need to pre-cook the Brussels sprouts, but that really doesn’t take any time at all. Once they’re done, it’s just a question of throwing everything in a pan for a few minutes and stir-frying. Eating from a bowl somehow makes this dish really comforting. If you use short grain brown rice as I did, you can try eating the contents of your bowl with chopsticks. It makes us feel that we’re having a sort of Japanese experience and it also means the food lasts longer. CT just wolfs it down if he uses a fork or spoon. Black sesame seeds and nori seaweed flakes add additional flavour and nutrition, but neither are necessary, so if you don’t have them, just leave them out. You can use a commercial teriyaki sauce, but it really doesn’t take long to make your own. I’ll be bringing you my homemade teriyaki sauce recipe in a future post. People seem to have a love it or hate it attitude to Brussels sprouts. I put it down to school meals where they used to boil the poor things to death. If they’re cooked too long, they can develop an obnoxious sulphur flavour and the texture becomes decidedly soggy. But cooked well, they can be delicious. Try my teriyaki rice bowl if you’re looking for a recipe to convince you. Do look for fresh sprouts though. I find ones that have been hanging around for a while just don’t taste as nice. 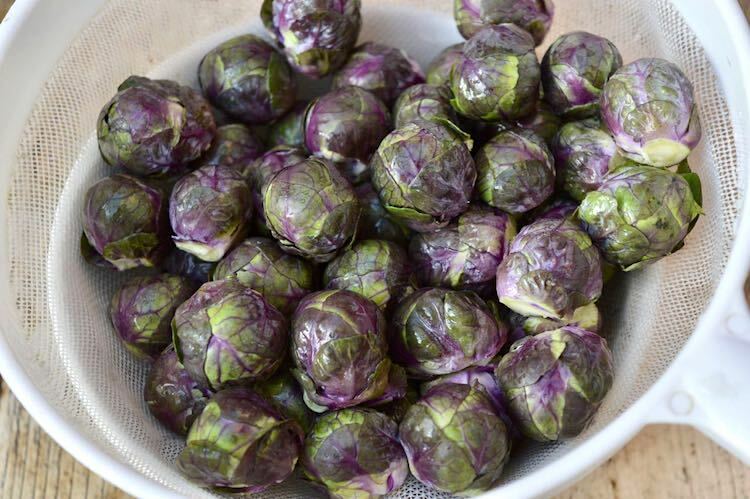 The British eat more Brussels sprouts than any other country in Europe apparently. Where would Christmas be without them? I bet not many have enjoyed them in this teriyaki rice bowl though. Sprouts are incredibly nutritious. They’re rich in antioxidants and are particularly high in vitamins K and C. If this wasn’t enough, they have a particularly high fibre content, which is good for gut health. I managed to get hold of some little purple sprouts still on the stalk for this recipe. They went dark green once cooked, but looked pretty when raw. The sprout season is a short one, but you can easily substitute kale or cabbage if you can’t get hold of any. An easy, quick and delicious plant-based midweek meal. Make your own teriyaki sauce (recipe coming soon) or use a commercial one. Rinse the rice well and drain. Place in a small lidded saucepan. Cover with fresh water to about twice it's depth and bring to the boil. Lower the heat to a bare simmer and cook for 15 minutes. Turn the heat off, but leave to steam with the lid on for a further 5-10 minutes. Whilst the rice is cooking, cook the sprouts in a pan of salted water for about 5 minutes until barely tender. Drain, refresh in cold water, then drain again. If the sprouts are small, keep them whole, otherwise half or even quarter them if they are particularly large. Heat the oil in a large frying pan (or wok if you have one) over a moderate heat. Add the chilli, garlic and ginger and stir-fry for 30 seconds. Add the sprouts and tofu and stir-fry for a couple of minutes. Add the sesame seeds and stir-fry for another minute. When everything is hot and slightly coloured add the teriyaki sauce. Stir, heat through and serve. Pour the toasted sesame oil into the rice and fork through. Divide the rice between two bowls, spoon in the teriyaki sprouts and tofu, then sprinkle with black sesame seeds and nori flakes. Eat with chopsticks if you dare. If the rice hasn't been soaked or only soaked for a short while, it will need longer to cook. No sesame oil? Replace it with a neutral cooking oil of your choice. Please note: calories and other nutritional information are per serving. They're approximate and will depend on exact ingredients used. 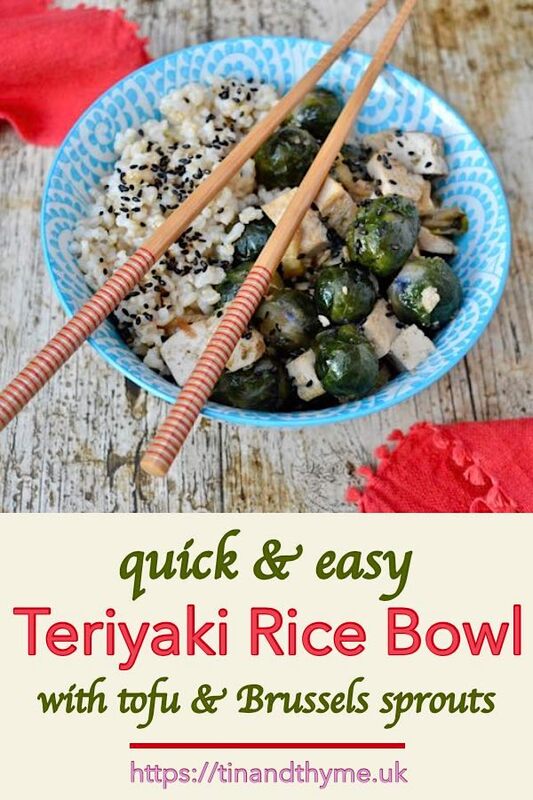 I’m sharing this recipe for teriyaki rice bowls with Easy Peasy Foodie for #CookBlogShare. Thanks for visiting Tin and Thyme. If you make this teriyaki rice bowl, I’d love to hear about it in the comments below or via social media. Do share photos on social media too and use the hashtag #tinandthyme, so I can spot them. For more delicious and nutritious recipes, follow me on Twitter, Facebook, Instagram or Pinterest. Teriyaki Rice Bowl. PIN IT. Thanks for sharing this wonderful recipe. This teriyaki rice bowl recipe is too good. Thank you. It’s delicious, nutritious and super fast to make too. You didn’t miss cheese??! I’m impressed lady! And yeah, I could never give up butter when I went dairy free, but happily it doesn’t affect me like milk does. And can I just take a moment to swoon over sprouts, I freaking lurve them. It does make me sad when folk moan about them as they are so damn delicious. Looks delicious, I love teriyaki but have never thought to use it on sprouts. I have to try give this a try. Great to hear you got on so well with Veganuary! The great thing about sprouts is that they are so quick to cook, so you can have this teriyaki on the table in no time. Thanks Camilla. So glad to hear there’s so much sprout love out there. It’s a much maligned vegetable. I am addicted to brussels sprouts! Your teriyaki tofu bowl looks so yummy :-)) Congratulations on completing the Jan. vegan challenge! Yum, I eat tofu on a weekly basis so I’m always happy to find new recipes for it! I’m glad you didn’t find Veganuary as difficult as you thought you would! Do you think you’ll eat less dairy now? I rarely eat it at all now. I think of you as the tofu queen Cathy 😀 I’m planning on having at least one day a week where I only eat vegan foods from now on. But cheese is just so convenient. Congratulations on completing Veganuary! I’m not sure how i’d do but you’ve definitely made it sound easier than I thought. Your teriyaki rice bowl looks delicious. I love sprouts so it is right up my street! Thanks Anna. I’m really pleased I managed to stick to it, but it wasn’t nearly as hard as I thought it would be. The rice bowl is really scrummy and so quick to do. It was fun to do and not nearly as difficult as I thought it might be. But I was purposefully restrained in not eating out. It’s definitely worth doing and for you, it would get the rest of the family eating vegan for a while too. I’m so impressed by your discipline, Choclette – especially on the cheese. Living in France, I’d go crazy without it! As for Brussels Sprouts, we don’t eat much of them but looking at your recipe I’m tempted since I love teriyaki. All the ingredients look super! Interesting about the Brits and sprouts! I expect no-one else requires sprouts for their Christmas dinner like we do Jill 😀 I was seriously impressed with myself on the cheese front. Weirdly, I haven’t been eating much of it this month either. It’s great that veganuary went so well for you! This recipe sounds delicious and it’s great to see something a little different with brussel sprouts – they really do seem to get forgotten about after Christmas sometimes! Yes it’s a shame about the poor maligned sprout. I’ve another load waiting to be used and will probably make this recipe again – it’s becoming a bit of a habit.